The capital city of North Sumatra, Medan is one of the biggest cities in Indonesia. Mostly underrated due to its traffic and “just another big city”, Medan actually has much to offer once you know where to look. Medan is more than meets the eye and has a bunch of destinations worth your visit in Indonesia especially if you’re a history enthusiast. Medan is an easy reach destination that’s for sure. By plane you can land in Kualanamu International Airport, or by boat you may dock in Port of Belawan. Historically attached to the Dutch Colonies and Malay culture, Medan still holds the nuances of Dutch, Chinese, and Malay culture in every corner of the city, thus this multiethnic city gives you unique experience during your stay. Located in Jalan Sultan Ma’moen Al Rasyid, Istana Maimun was a symbol of Deli Sultanate’s golden age. Built around 1800 by the ninth King of Deli Sultanate, this grand palace has 2 story and 30 rooms on more than 2000 meters square of land. 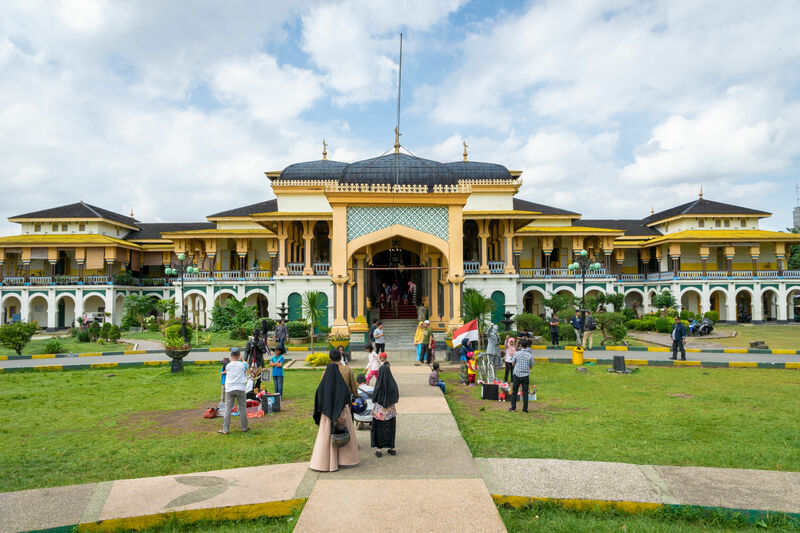 One of the magnificent facts about Istana Maimun is that his building combines Malay, Dutch, Turkey, India, and Spain architectural design. The roof very much resembles the Middle East architecture, while the European touch can be seen from the furniture decorating the palace including the epigraph written in the Dutch language. Istana Maimun has yellow dominated color all around the palace, it is believed that yellow is the majestic color of Deli Sultanate. While enjoying the palace, you may also rent a traditional outfit used to wear by the nobles and taking pictures in it. Tjong A Fie Mansion is another historical site in Medan. It was built by Tjong A Fie, a Chinese original businessman during 1800-1900 era. Tjong A Fie came to Sumatra with very little money. After years of hard work, he slowly became the richest Chinese businessman known to the locals as well as the Dutch. Tjong A Fie is known for his generosity, donating a lot of his money to build mosques, temple, bridges, and even a bank. Like many other buildings in Medan, Tjong A Fie Mansion accentuates Chinese, Europe and certainly Malay architecture. Inside the mansion, the visitors are welcomed with the photos of Tjong A Fie with his family and the Dutch authorities. In the mansion, you will find 4 living rooms each with different purposes. On the second floor, it has a vast room to hold dance parties. Medan has been also been proclaimed as a multicultural destination, diver ethnics, cultures and faiths are living side by side in this busy city. While visiting Medan, don’t miss out the chance to see the magnificent religious sites all around the city. One of Medan’s iconic site is Masjid Raya Al Ma’shun at Jalan Sisingamangaraja 61, not too far from Istana Maimun. It’s another historical site because it was built in 1906 by the ninth Deli Sultan. This grand mosque blended India, China, Europe, and Turkey design. The structure is asymmetric octagonal with white, Tosca and black color. Prepare yourself to see the biggest Buddhist Temple in Indonesia, Maha Vihara Maitreya in Perumahan Cemara Asri. Inside the temple, there is a huge gold-coated Buddha statue and the wall surrounding the area is rich with engravings. This temple consists of three areas: Baktisala Umum as a place to worship, Baktisala Maitreya and Baktisala Patriat Suci to hold the grand ceremony, and a gathering hall. This place is open for the public and is free of charge. The grand church of Graha Maria Annai Velangkani in Jalan Sakura III, Tanjung Selamat Medan is another religious site for the Catholic. At a glance, the building looks so much alike as Hindu Temple in India. This church is devoted to Holy Mary known in India as Annai Velangkani, and thus the thick nuances of Indo-Mogul architectural design can be seen anywhere in this church. The tower shaped-like building has 2 floors, 7 tiers of towers and 3 domes. Kuil Sri Mariamman in Kampong Madras is the oldest Hindu Temple in Medan. Built in 1880ish, this temple is almost the same age as Istana Maimun. The nuances of the temple are similar to those in India and Sri Lanka. Decorated with tiers of towers, reliefs, and statues of Shiva is the main entrance. There are 3 chambers inside the temple to worship Lord Vishnu, Siva, and Brahma. Behold to see the biggest crocodile breeding park in Indonesia, Taman Buaya Asam Kumbang (Asam Kumbang Crocodile Park) located on Jalan Bunga Raya, Sunggal Medan. This breeding park was originated from a local named Tham Lo Muk who loves reptiles. This park has more than 2000 crocodiles with various kinds. Ranging from the young ones to the old ones – as old as 40 years old. This place is also designed safely where the reptiles are placed in ponds and an artificial lake. What are you waiting for? Plan your trip and book your accommodation right away!